Temperature Humidity chambers are used to perform various tests to determine the reliability of the electronics products that have been designed before they are allowed to go into mass production. One of the main usage of the chamber is to do temperature and humidity cycling. This test is to ensure that the electronic device will survive those environmental conditions expected during the storage, shipping and operational periods of the device. In the control of humidity, it is not necessary to control it when the temperature is 0 Celcius and below. Allowing the relative humidity to go below 10% is good enough. At temperature of 50 Celcius and above, the control of relative humidity is needed to prevent condensation on the electronic devices under test. After a period of high temperature and high relative humidity, it is necessary to dry out the chamber to the lowest possible RH(relative humidity) before reducing the temperature to avoid any condensation on the device under test. Some examples of the test standard that one can consider is listed below. However, it is always better to check the test standards and methods from reliable sources such as IEC and ASTM. 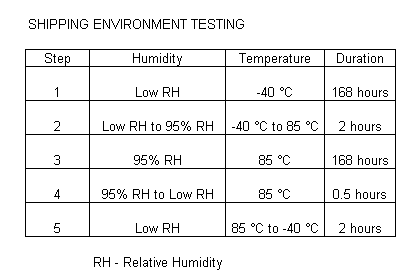 Table below shows an example of a temperature/humidity settings to test the shipping environment that an electronic products may be subjected to. The parameters may be changed according to the products that are tested. At the end of the test, a performance test should be performed to check the operations of the device. 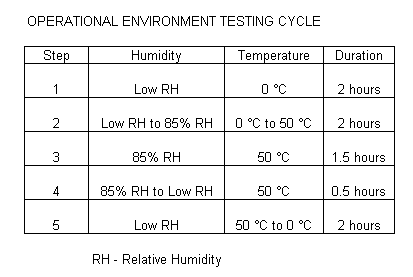 Table below shows an example of a temperature/humidity cycle to test the operational environment that an electronic products may be subjected to. The parameters may be changed according to the products that are tested. At the end of the test, a performance test should be performed to check the operations of the device. The device should be powered up during the entire duration of the test with maximum loading. 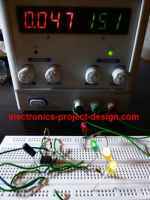 The input power supply should be adjusted to input AC power line plus 15% at 50 °C and AC power line minus 15% at 0 °C. The cycle should be repeated for at least 60 cycles.